Community mining is a prominent approach for identifying (user) communities in social and ubiquitous contexts. While there are a variety of methods for community mining and detection, the effective evaluation and validation of the mined communities is usually non-trivial. Often there is no evaluation data at hand in order to validate the discovered groups. This paper proposes an approach for (relative) community assessment. We introduce a set of so-called evidence networks which are capturing typical interactions in social network applications. Thus, we are able to apply a rich set of implicit information for the evaluation of communities. The presented evaluation approach is based on the idea of reconstructing existing social structures for the assessment and evaluation of a given clustering. 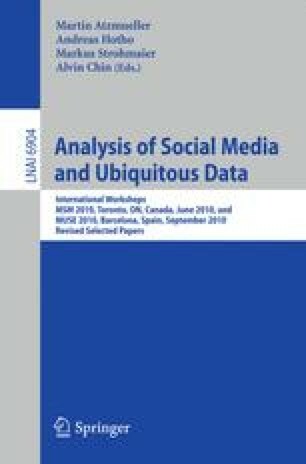 We analyze and compare the presented approach applying user data from the real-world social bookmarking application BibSonomy. The results indicate that the evidence networks reflect the relative rating of the explicit ones very well.